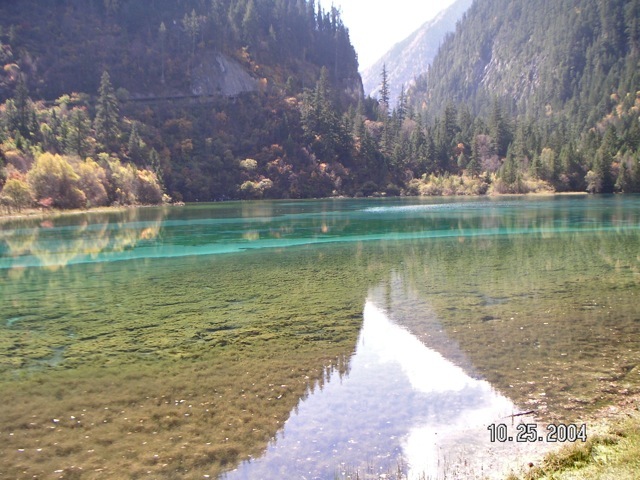 Ten or more years ago, the only way to go to JiuZhaiGou 九寨溝 (Valley of Nine Villages) in SiChuan 四川 was by road. Once in awhile, a bus would plunge off the road and tourists were killed. The 10 hours drive from Chengdu 成都 to JZG 九寨溝 was very intimidating, but the beauty of JZG was so alluring some people would brave the hardship. This road was cut into the sides of high mountains and winded along steep cliffs. 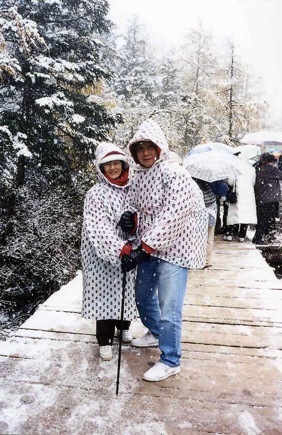 By the time we visited JZG in 2004, we were able to avoid the dangerous bus trip. 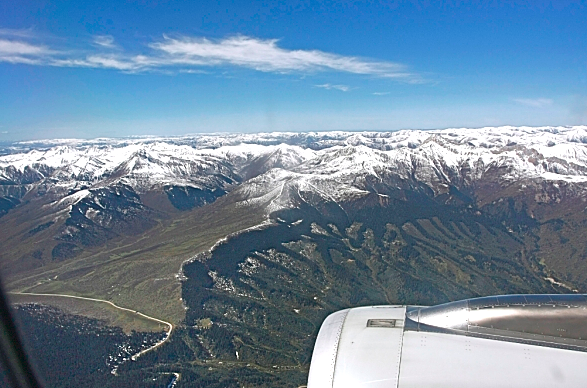 We flew to the new two-mile high JiuZhai-HuangLong Airport 九寨黃龍機場 cut from mountain tops. Before the airplane landed in the precarious one-runway airport, it flew over some ruggedly beautiful snow capped mountains. 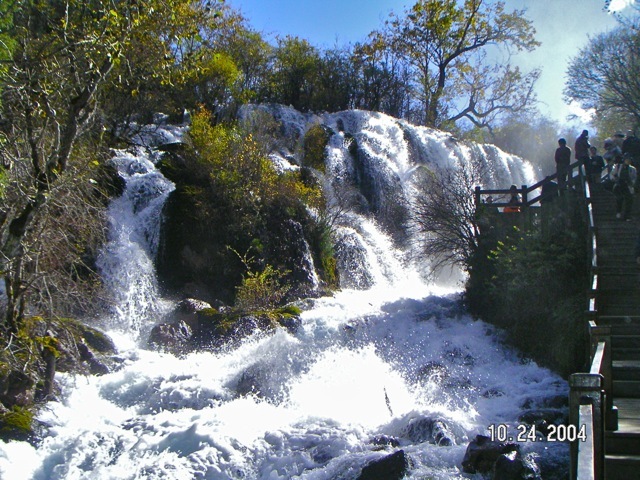 JZG is noted for the beauty of its water, and was named an UNESCO World Heritage site. We were not disappointed. 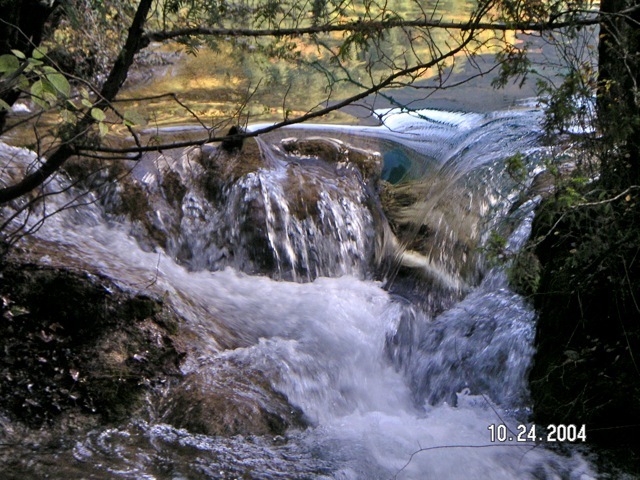 This bubbling wide stretch of rushing water was aptly named Pearl Shoal 珍珠灘. 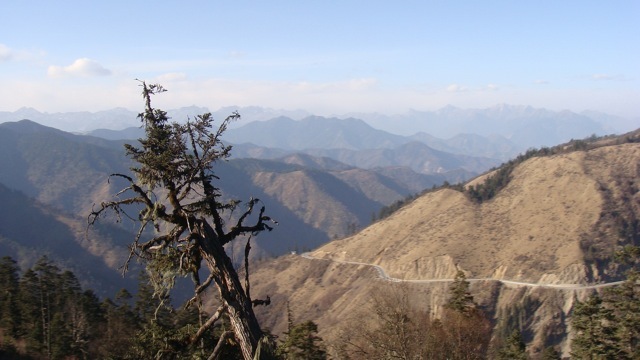 JZG is a Y-shaped valleys hosting nine villages of Tibetan and Qiang 羌 peoples. Surrounding mountains feed plenty of ground water into voluminous lakes linked by rushing streams and spectacular waterfalls along the 5-mile long valley floor. 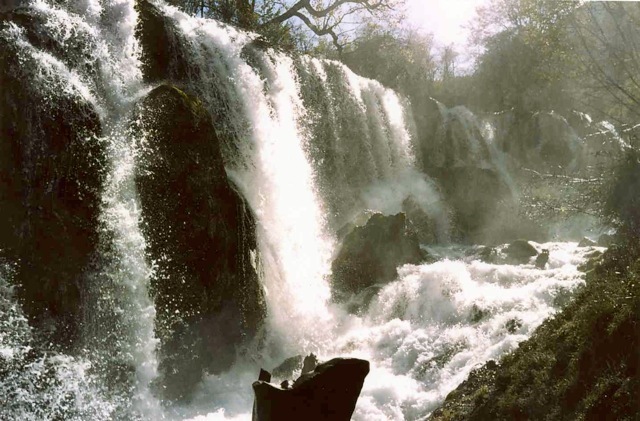 The visitors walk alongside large roaring waterfalls. 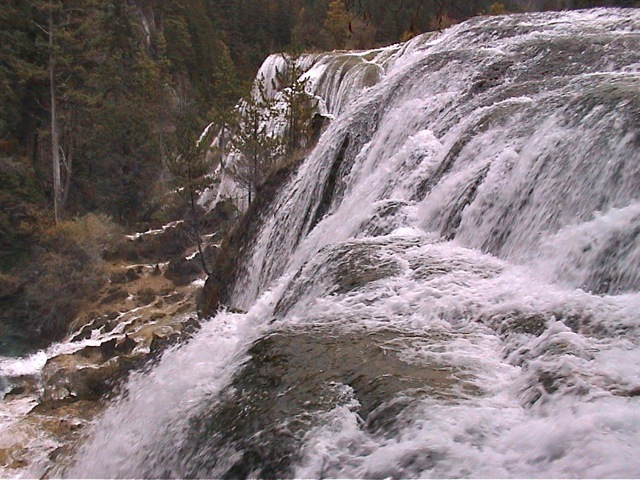 Some observation platforms are built over the boiling waterfalls, giving the visitors a resonating view of the falls. Only one other site is said to rival JZG’s watery beauty. 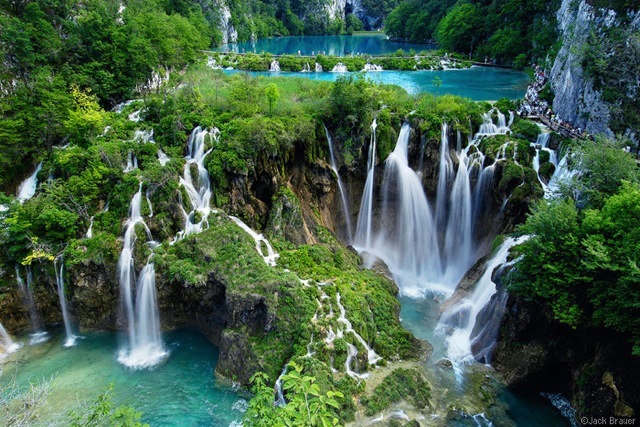 It is the Plitvice Lakes of Croatia which is also a series of lakes linked by waterfalls. I would like to visit this place some day. 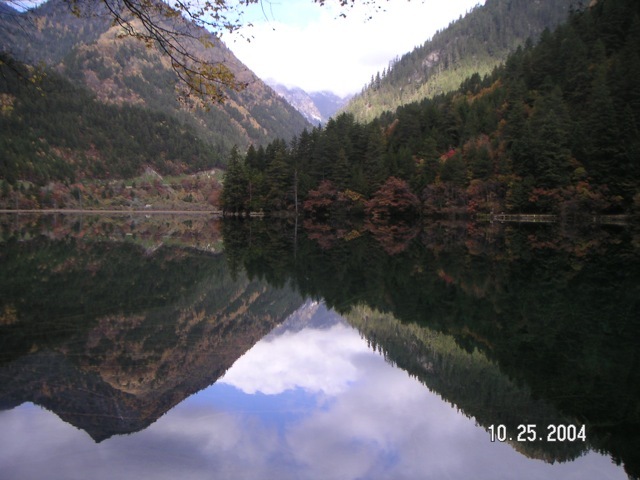 Some lakes in JZG are large and placid with mirror-like water that reflect mountains perfectly. 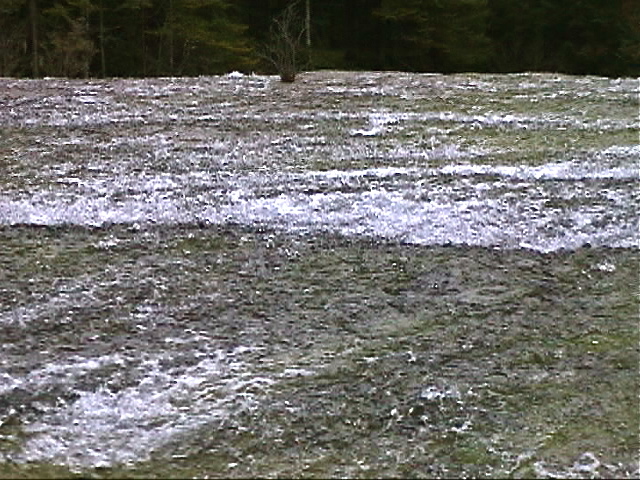 Before surfacing in JZG, ground water percolates through limestone mountains and become laden with microscopic calcium carbonate crystals 鈣花. The crystals act as magnets that remove particles and sediments in the lake water, clarifying the water. These tree trunks lying in the lake bottom are lucidly visible. The most famous feature of JZG is the magical colors of the lakes. 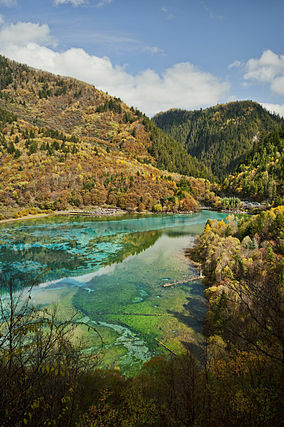 Depending on the plants, rocks, residues and reflections, the lakes appear in blue, green, yellow and turquoise colors. The calcium carbonate crystalize and form barriers. 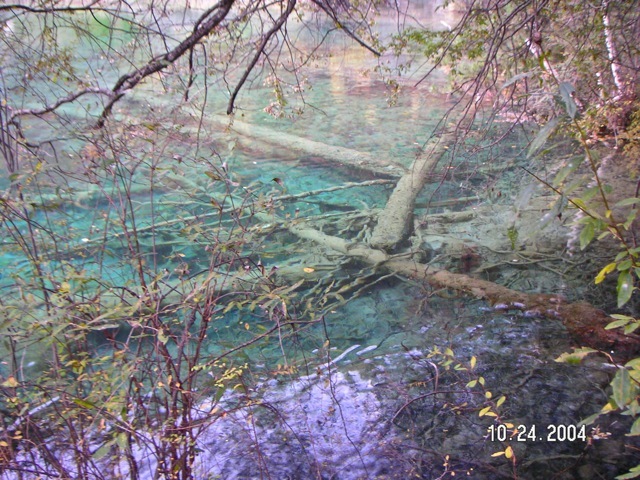 It is a joy to see crystal clear water dance down cascades and around standing trees. Most of the streams meander through heavily wooded forests. 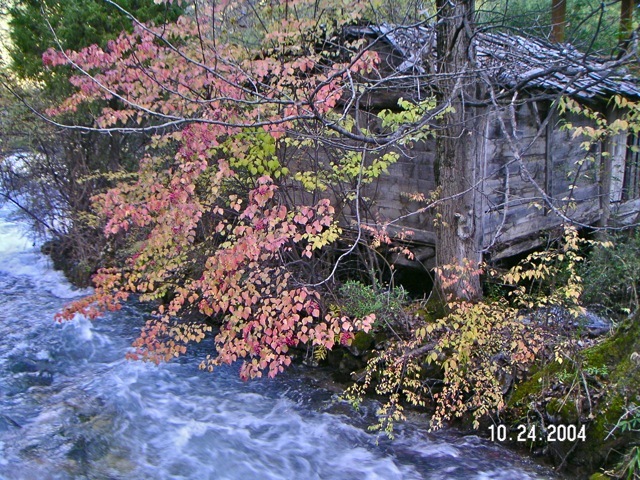 A wood shed makes the scene almost European. 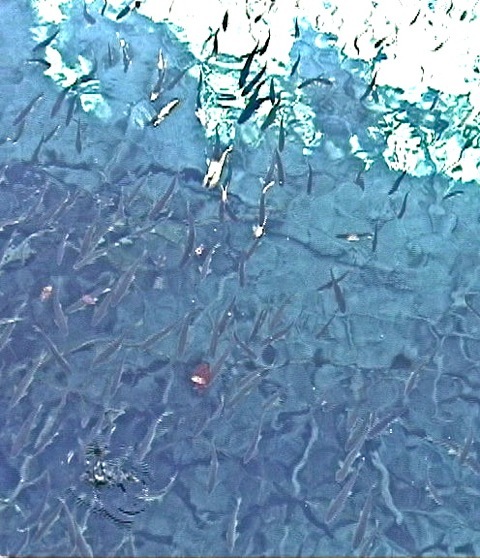 Schools of fish are visible in the clear water. As the place is a protected reserve, the fish do not fear being caught or disturbed. JZG is unique in China for being very well managed. Wooden boardwalks carry visitors and preserve the pristine grounds and water. Park employees patrol the paths and stop visitors from smoking or littering. 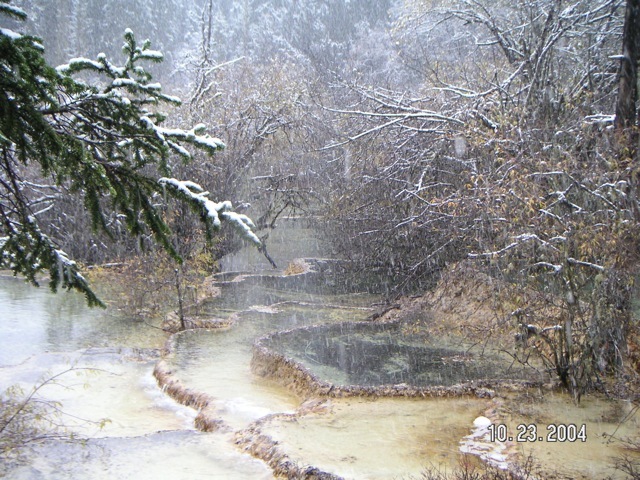 In higher elevations, snow fell and dusted the trees, creating a natural fairyland of subtle and otherworldly colors. 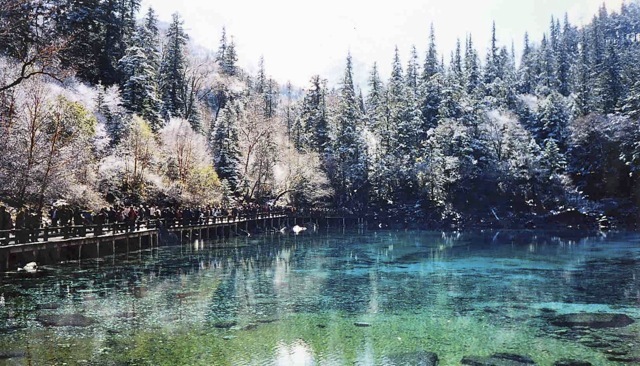 We visited HuangLong 黃龍, sixty miles from JZG. 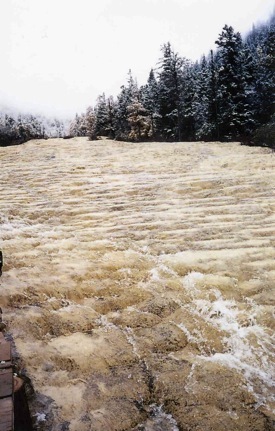 This valley is also blessed with a voluminous stream laden with calcium carbonate crystals. 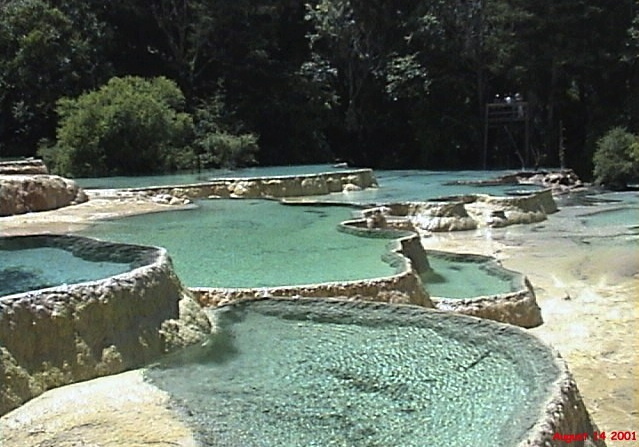 More than JZG, the calcium carbonate form cascading pools filled with crystal clear and colorful water. A long stretch of flat floor creates a washboard of dancing water. While we were on the boardwalk, a sudden snowstorm fell. I found the soles of my athletic shoes very slippery on snow covered planks. We gingerly hobbled down the hill, hanging onto each other for support. We saw a dozen people slipped and fell spectacularly on the boardwalk. But the snowstorm was not all negative. We were blessed with a wonderful scene shown in this photo. It was one of our most memorable and beautiful experiences. On the way to the airport, our bus drove on foggy, snow covered switch-backs. 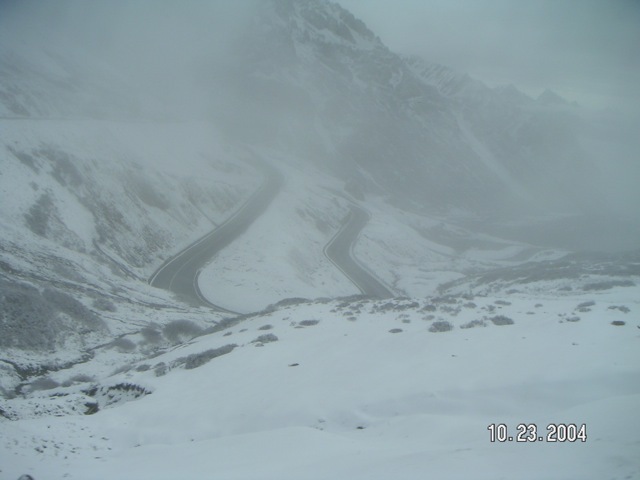 We were glad it was a relatively short drive and that we did not have to ride on such condition for ten hours. Posted by Robert Wu on Saturday, February 25, 2012, at 1:30 am. Filed under Uncategorized. Follow any responses to this post with its comments RSS feed. You can post a comment or trackback from your blog.